"I am a mentor, a mentee, a trainer, an activist and a friend." Hey, folks. You know what time it is. Gather 'round, because it's time to meet the Angry Reader of the Week, spotlighting you, the very special readers of this website. Over the years, I've been able to connect with a lot of cool folks, and this is a way of showing some appreciation and attention to the people who help make this blog what it is. This week's Angry Reader is Kathleen Wong(Lau). My name is Kathleen Wong(Lau), and I am an academic, educator and facilitator. I'm the director of the Southwest Center for Human Relations Studies at the University of Oklahoma and the director of NCORE, the National Conference on Race and Ethnicity in Higher Education. I am a mother, a wife, a daughter, and an educator. I am a mentor, a mentee, a trainer, an activist and a friend. I am a geek. I love reading about research on the social psychology of racism, sexism, homophobia, classism and the science of social change. I am an optimist and pragmatist. I LOVE cooking (and eating). Lately I like watching videos on Maori haka and Asian Indian bhangra. I also like dog videos. I love Minecraft, it's clever and creative. I am a runner, but can't/don't run as far as I used to when I was younger. I currently live in Norman, Oklahoma with my husband, two children, my parents (part year residents with us), and four rescue dogs. We moved here a little over a year ago from Kalamazoo, Michigan. I am often standing at my desk working on my laptop here at University of Oklahoma though by 3pm I am sitting at my desk, sitting already today. Very tired! I was born and raised in California. I spent most of my childhood in the Oakland Bay Area and worked there until my mid-twenties. I was a bilingual counselor for a TRIO program in San Francisco Chinatown for several years. I was also a union butcher in Oakland. I have lived in Massachusetts, Arizona, Michigan and now Oklahoma. I like to say I am from the 1960s, 70s and 80s as these were the eras and times in which I grew up in the Oakland Bay Area as a child of working class Hong Kong Chinese immigrants and this influences who I am today. I am Chinese American, Asian American and a woman of color. I am working class in terms of sensibilities and culture. I spend a great deal of my time writing training curriculum, consulting and facilitating training in higher education, private sector and non-profit sectors on diversity and inclusion. Some of the work I do is driven by strategic planning for the future of an organization and much of my work is done because of a needed response to a specific crisis resulting from hate incident, social media incident, or other long standing experiences of institutional racism, sexism, homophobia, or other types of incidents. The issues of police brutality on Black Americans as well as other groups have been a catalyst and opportunity for campuses to reflect, respond and take leadership on issues of systemic racism at their institutions. I try to do as much as I can to confidentially interview and research the specific issue and then design and recommend training that engages across the broader organization. 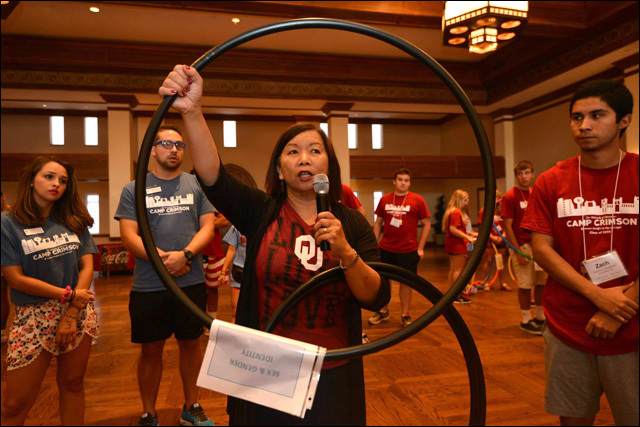 I just spent this summer facilitating training for 2,600 freshmen in a mandatory Freshmen Diversity Experience at University of Oklahoma during their summer orientation camp where we culminated with a 3 hour intergroup dialogue program. In the fall I will go to University of North Carolina to work with women of color and white women faculty on intergroup collaboration/communication and intersectional identity. I have also trained IT departments in corporate settings and sixth graders in intercultural conflict skills. I direct the National Conference on Race and Ethnicity in Higher Education which will be in San Francisco in 2016. I have a FABULOUS staff who are good at what they do to keep NCORE a vibrant community. We are working hard to be responsive, forward thinking and inclusive especially on thinking outside the black/white binary, while including those still relevant dynamic. And we are attending to intersectional, multi-disciplinary and generational issues. I would say that I am at the time in my life where I am counting the academic seasons I have left before I retire, probably 15 seasons if I am lucky (I am 55 years old now). I am working hard to have impact, to train and teach on intergroup dialogue skills for innovation, social problem solving, and collaboration on social justice issues. I am trying to mentor others to do this work of using research based methods to help people simultaneously frame their understanding of stereotyping, stereotype threat, aversive racism, love prejudice as well as hate prejudice and as well as dismantle this mindless thinking through intense engaged perspective taking on issues of microaggressions across familiar and unfamiliar groups. I believe in the social science and I have witnessed incredible social change when people engage in structured conflict from different life experiences and are actually listening to each other within the framework of intergroup dialogue. These changes are cognitive and lasting. I am also all about being a good mom to my kids and helping them have agency in negotiating issues of social justice. My children when possible come along and assist in our programming and my daughter has been trained as an intergroup dialogue facilitator even though she is still in high school. I guide them to help them process their own experiences of racism directed at them, but also at others. Being Asian American and mixed race is like being on a tightrope sometimes in a predominantly white institution of public school. I would say that one of the things that makes me angriest on a daily basis is looking at our nation's higher education institutions knowing who is missing from our institutions at the student level, student affairs level, faculty level and administrative level. I feel that absence everyday everywhere I look. I am not just looking at representation, demographic percentages, but critical mass. Do we have a critical mass of different people so that we can have the synergistic benefit of creativity, innovation, community building, pipeline building so that we are setting up the dynamics to build our next generation of leaders in every community and in every segment of our economy and public sector? Who is not here? I can say I feel a terrible rage sometimes, but it keeps me going in my life's work. Another thing that makes me angry in the work of social justice in higher education is the lack of focus in critical thinking skills that includes cognitive empathy or perspective taking. We are a society that values perspective giving -- speak your mind, the squeaky wheel gets the oil. We spend an inordinate amount of time self-reflecting on ourselves and our identities and while this is important, we need to reflect on the lives of others, take the perspectives of others, become literate in the perspectives and experiences of others, engage in difference and challenge ourselves to advocate for others. We also need to learn to facilitate others to listen and perspective take as well. These are skills we need to build an inclusive and just society. We can't have equity if people who take up all the talk space in society don't cede the floor to others and then complain about how others are too angry, too strident, too rude, etc. They are loud and they are complaining because they are unheard.